Irish set-dancing is a social form of Irish dancing which originated at the beginning of the 19th century but only found its full development in the second half of the 20th century. It is a dance form which you can encounter in Irish pubs several times per week and you do not need any special movement capabilities (just like when you want to dance a polka or a waltz at a regular ball in the Czech Republic). You can find set dancing only in a few places in the Czech Republic, which is a result of insufficient information about this activity. This history has a similar length as the history of Irish dancing in general. I think we heard about sets sometime in 1997 when we visited Ireland and found out that such a dancing form existed and that many people were involved in it there. We realized it was not as impressive as hard shoe dancing but we still found some charm in it. Irena Samcová brought a description of Clare Lancers to Rinceoirí after one such visit to Ireland. And thus we started putting this dance together, without the knowledge of terminology and proper dance technique. Although this dance was sometimes practised, we knew that something was missing. Then it was put aside and Irish set dancing with it for a while. In 2001 my family visited Willie Clancy Summer School in Miltown Malbay in Ireland. Here we became acquainted with this form of Irish dancing culture not just through dance workshops led by Paddy Neylon, Mary Clancy and Geraldine Connolly, but especially through the afternoon and evening ceilís in the Armada Hotel. Therefore we included an introduction to Irish set dancing in the programme of the 2nd and 3rd Summer Schools of Irish Dancing. The first teacher who presented them on my request was Sean Kilkenny. However they are considered just a diversion. In 2003 I decided to introduce proper set dancing workshops. I contacted Joe O’Hara from England over the internet. His reaction was surprisingly friendly and thus the weekend of 20–21 September 2003 is the time of the first set dancing workshop led by Joe and his wife Janet. There were 32 participants. The first day was spent with Caledonian Set and Plain Set. The second day with Cashel Set and Newport Set. The following month a dance evening took place in Prague together with some people from Ireland and the Brian Ború Ceilí Band. The evening at the Na Slamníku restaurant was organised by Helena Janoušová who invited her Irish friends to Prague and also invited people interested in set dancing to come and learn something. The dancing was led by Mrs. Angela Bernard, but one from Dublin . But even this evening did not start up any greater interest in set dancing. September 2004 was another possibility to meet with the O’Hara’s to practise in Prague. There were not even two complete sets. Joe and Janet taught us various pretty figures from numerous dances. Irena Samcová attempts something similar in Coiscéim. She engaged Helena Janoušová and later Brendan Taggart from Dublin with whose help she organised several workshops. They managed to form a group of adult dancers without any special dance ambitions who were spending time learning under Helena’s leadership. After some time this group becomes independent. Its dancers then attend the 6th and 7th Summer school of Irish Dancing where Joe and Janet again teach set dancing. The group led by Helena Janoušová is now called The Prague Irish Set Dancers. Its members systematically practise Irish set dancing. They meet every Thursday in a small gym of the Jedlička Institute. Apart from this group there is another one in Stříbro called The Silver Irish Set Dancers. Some dancers from this group together with The Prague Irish Set Dancers participated in Willie Clancy Summer School a Set Dance Week v Miltown Malbay in 2009. The Prague Irish Set Dancers also participated in Bernard’s Summer School 2009 where they attended the workshops led by Gerard Butler. They also still cooperate with Joe and Janet O´Hara who lead set dancing workshops in Prague from time to time. After about ten years, I get to add some more to the history of Irish set dancing in the Czech Republic from what has happened in this area more recently. In spring 2009, another dance group focusing on Irish set dancing called The Silver Irish Set Dancers was founded in Stříbro. The person who put this group together with about two sets of people interested in this dance, Stanislava Šmahelová, also led the band called Corchen. In July of the same year, a total of 16 members of the Prague Irish Set Dancers took part in the Armada Set Dancing Week at Spanish Point near Milltown Malbay in Ireland. It was a great success to motivate so many dancers to take part in an event that showed the dancers Irish set dancing in its most interesting form, and I think that this affected their interest in this type of dance for some time. Another motivating element that contributed to the interest in Irish set dancing at this time was Bernard’s Summer School 2009, where Irish set dancing was first taught by Gerard Butler. And the last major event of this year was a workshop of Irish dancing set with Joe and Janet O’Hara at the turn of October and November (31/10-01/11.) in Prague. An important event of 2010, which also influenced the following years, was a new contact with the organiser of the Set Dancing Weekend in Erlangen, Germany, Andrea Forstner and her family. Following this, 6 dancers from The Prague Irish Set Dancers took part in her weekend in Erlangen, which took place on 12-14 February. Since this visit, Erlangen has become a place for Czech set dancers to encounter Irish set dancing at a very good level, also supported by the excellent Abbey Ceilí Band and teacher Pat Murphy. At the end of February, Gerard Butler visited Rinceoirí in Prague for the weekend, and during the visit he made one workshop for the set dancers. Another workshop was organized by The Prague Irish Set Dancers in May (8-9 May) with Joe O’Hara, who also introduced his successors – Kevin Monaghan and Carol Gannon. Joe did not feel like continuing to travel to the Czech Republic at his age and thus he recommended Kevin and Carol for further cooperation. 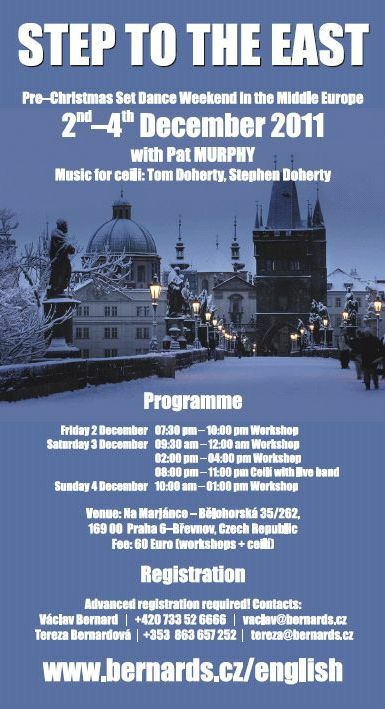 On 16 December, The Prague Irish Set Dancers training is visited by Sharleen McCaffrey and Brendan Doyle from Ireland, who are on holiday in Prague. We remain in touch with them even after their departure. Upon finding out that Brendan is also a boxing player in The Lough Ree Ceilí Band, we’re starting to think about organising a set dancing weekend. In 2011 we return to the Erlangen Set Dance Weekend organized by Andrea Forstner. This time a total of 14 dancers travel from Prague. We also meet Kevin and Carol in Erlangen again. They, like us, become regular participants in this event in the years to come. 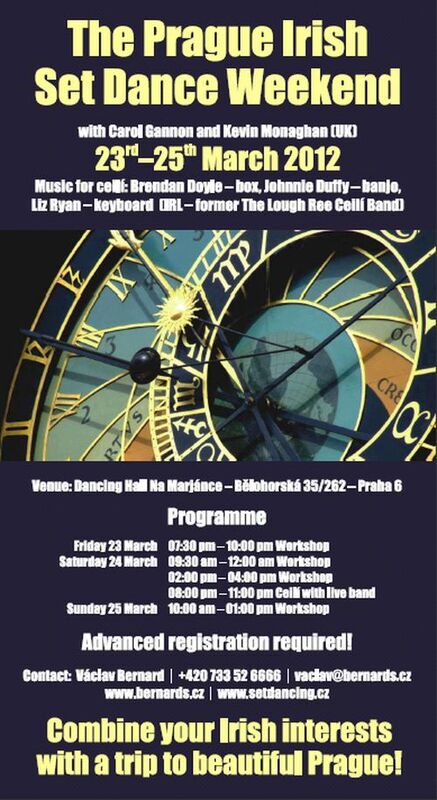 On 8-10 April, The Prague Irish Set Dancers organize the first set dancing weekend in Prague with the help of Kevin and Carol and with the musical accompaniment of the later Rise the Dust Ceilí Band, consisting of Brendan Doyle, Liz Ryan and Johnnie Duffy. Around 50 dancers who came from Germany and the UK also attended the weekend. The event did not go very well unfortunately, as the landlord and publican František Němec turned out to be just a common fraud. A month later, some of the Prague Irish Set Dancers attended a set dancing weekend in the village of Violau near Augsburg, led by Gerard Butler, with musical accompaniment provided by Johnny Reidy Ceilí Band. This event has also become popular with our dancers over the years because it had taken place in a very nice environment. However, the refugee crisis in the years to come has contributed to the disappearance of this event, as the accommodation building in Violau was used to accommodate refugees. The year 2011 was also significant since Kevin and Carol got married on 2 July, we visited their set dancing weekend in Basingstoke in September (23-25 September), and in November (18-20/11), we visited the Sean Óg Festival in Longford organized by Gerard Butler. If I remember well, in September in Basingstoke Kevin also introduced his system of screened cues. It was based on the figures of the dances, described in abbreviations, were projected on the wall by Kevin during the dance and thus saved him from calling through the microphone. Dancers have to have at least some notion of the dance first though, and the help on the wall is just a reminder. Eventually he extended this help to the descriptions of all the dances danced at the events organized by him. Simply a solution that would deserve some award in the form of a Dance Nobel Prize. At BSS 2011, sets were taught by Gerard Butler. Still before the end of the year, we organised another set dancing weekend as the Bernard family, titled Step to the East, on 2-4 December. Pat Murphy helped us with the programme and Tom and Stephen Doherty assisted with music. The venue was a beautiful hall at Na Marjánce in Prague 6. During this weekend we also invited the dance group led by Jitka Bonušová, who performed for the participants the most famous Czech quadrille, the Czech Beseda. In 2012, the Prague Irish Set Dancers organise the 2nd Prague Irish Set Dance Weekend on 23-25. March with Kevin and Carol Monaghan and Rise the Dust. The number of participants increases slightly, and it helps in particular that a Prague dance group called Sona Sól starts to include set dancing in their repertoire. On the other hand, the group from Stříbro is experiencing a participant crisis, which will soon lead to its demise. Pat Murphy teaches sets at BSS 2012. The year 2013 is a year of gathering experience at available dance weekends. We are visiting a dance week in Ennistymon for the second time, which has inspired us in the past with its title Step to the West. It was held at the end of January. Erlangen in February is followed by Violau in June, a summer Basingstoke in July. Sets at the summer school are again taught by Gerard Butler. The Prague Irish Set Dancers do not hold a weekend in Prague this year. The reason is that there are not enough people who would take on the organisation of the weekend. The Prague Set Dancers return to holding the Prague Irish Set Dance Weekend in 2014 (4-5 April). The weekend is led by Kevin and Carol and Deenagh Ceilí Band are invited from Ireland as musical accompaniment. The venue is the DDM Hall in Prague 2. During the year, we visit dance weekends in Erlangen, Violau and newly also in Heidelberg and Lille. The tradition of a New Year’s Ceilí was launched by Bára Tusarová, then a member of the Sona Sól group, on 4 January 2015. It took place in the gym of the Botičská primary school and the Czech group Rookery Ceilí Band played for the dancers. Participants were almost exclusively from the Czech Republic. The Prague Irish Set Dance Weekend is organized by The Prague Irish Set Dancers on 24-26 April. Kevin and Carol are invited to the weekend, and the Salamanca Ceilí Band provides musical accompaniment. After this weekend, an agreement was reached between The Prague Irish Set Dancers and Sona Sól that this group will be preparing the next weekend in 2016, and then the groups will alternate. Before the holidays, the Prague dancers go to Violau for the last time. Our family attends a weekend in Lille in the autumn. This year, several dancers from The Prague Irish Set Dancers make a journey to Milltown Malbay. This may also have had the adverse effect of cancelling the set dancing lessons from BSS 2015 due to lack of interest. The year 2016 begins again with New Year’s Ceilí organised by Sona Sól, and the same applies to the dancing weekend on 22-24 April (Kevin and Carol and Salamanca Ceilí Band). The name of the event is changed to Set Dance Weekend in Prague. It is held in the theatre hall of Prague Emmaus Monastery. The organizers were able to attract many foreign dancers. BSS 2016 has set dancing lessons taught by Mick Mulkerrin and Deirdre Tobin from Ireland. In the course of the year, I visit more events – beside Erlangen also Treuen, organized by Chris Eichbaum, weekends in Lille, in Frankfurt and in Herzberg, Switzerland at the end of the year. In 2017, the New Year’s ceilí gets an air of a regular event, where occasionally even someone from abroad (like Andrea Forstner) appears. The organizer is Sona Sól and Rookery are playing again. In March, Kevin and Carol announced a new event – St. Patrick’s Set Dance Weekend (17-19 March), placed in the village of Rotherwick near Basingstoke. We gladly participated in this event with a very pleasant atmosphere. And in less than a month (21-23/4) Kevin and Carol arrive in Prague to lead the Set Dance Weekend again under the baton of Sona Sól. Musicians from Rise the Dust took care of the musical accompaniment. Sets are again taught by Gerard Butler at BSS 2017 and Marie Garrity takes over in the second part of the week. We privately visit the weekend in Lille and newly also Bologna in early December. The New Year’s Day Ceilí (6/1) opens the year 2018 – Sona Sól and Rookery remain. In March, we again return to Rotherwick to celebrate the feast of St. Patrick and then on 27-29 April the Set Dance Weekend led by Kevin and Carol and Rise the Dust takes place. This year I felt that most of the participants were not from the Czech Republic. A quartet of dancers from Sona Sól take part in the Fleadh 2018 half set contest in Drogheda. A hot new feature is the set dance weekend in Vienna on 3 and 4 November. Kevin and Carol were chosen by the organizers. The only ceilí was accompanied by local musicians. Perhaps not everything that was important has been written down here. The fact is that there are two dance groups in the Czech Republic who are dedicated to Irish set dancing and both are from Prague. There are some modest efforts also in Brno, even though we do not hear much about them. Sona Sól, now under the leadership of the Macoszek couple (Tereza + Ondra), has taken the initiative to organize all public events associated with Irish set dancing, i.e. the New Year’s Day Ceilí and the Set Dance Weekend. The Prague Irish Set Dancers, who are active mainly thanks to Lucie Šulcová, only organize public trainings where everyone can come and dance. However, this group has no capacity to organize other events. At the same time, there is an effort within the Rookery band to form such a ceilí band that would be able to play properly during set dancing events. Irish – what, where, when? Set Dancing and Music weekend is from 17th to 19th May 2019. Lake Zurich Set Dancing Weekend will from 7 to 10 June 2019 under leading Maureen Culleton. Music Rise the Dust and Toe for Toe.